Deposits represent a key aspect of a workspace related business; this is why they are incorporated into several Operate modules, such as Space/Products or Accounts Receivable. The system-wide, high level configuration for your deposits is available under Settings > General > System > Operate Settings > Member Settings. This section contains a wider variety of configurations related to your space; however, we will only focus on the ones related to deposits, for the purpose of this guide. Calculate Deposit is a checkbox that allows you to enable deposits on your products/office spaces. Produce Separate Deposit Invoice allows you to invoice your customers for the deposit separately from any other charges they might have. This means that Operate will generate one invoice for the deposit and another for the other charges. 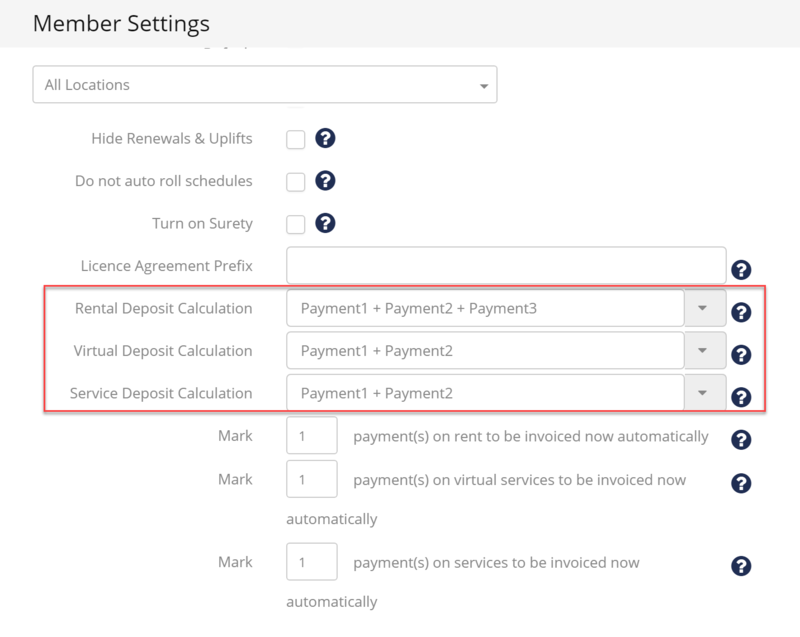 Configure how your Rental, Virtual clients and Service related deposits are being calculated by selecting how many and which payments to be collected as a deposit: e.g. : this can be 0 if you don’t require a deposit; or Payment 1 + Payment 2 (the first two months of rent), twice the highest payment, the equivalent of a yearly payment; etc. You can enter calculations manually simply by typing them into the field. Click the arrow on the right of the dropdown to select one of the existing calculations. This is an all locations option and if switched off the deposit can be edited on the customer's account regardless of what deposits/retainers have been invoiced. If switched on, the field is not editable and it will calculate based on deposits/retainers invoiced. When this option is changed, the user will need to log off and back on for it to take effect. Please note that the amount of a customer’s deposit may determine their credit limit if the Credit limit is auto set to deposit option is enabled under Settings > General > System > Operate Settings > General Settings.